The Kentucky Science Center has a rich history, from its founding as a cabinet of curiosities in the Public Library System of Kentucky in 1871 to its current status as the region’s leading resource for informal science education. 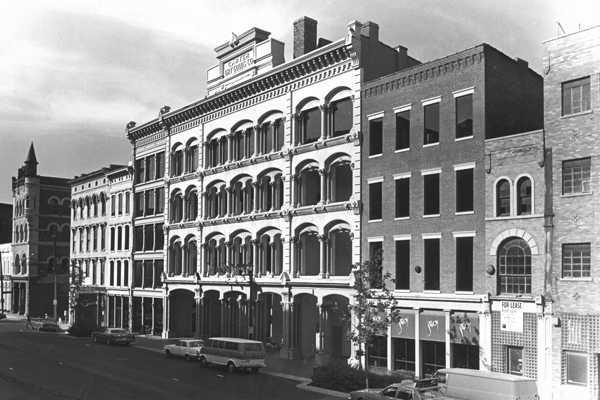 As part of the city’s efforts to revitalize downtown, the Science Center opened it’s doors at 727 W. Main St. in July 1977. Its designation by the Kentucky General Assembly as the State Science Center in 2002, and official name change in 2012, underscored its history of reaching all audiences and its active work providing informal science, technology, engineering, and math education to citizens across the Commonwealth. Boasting at one time little more than an Egyptian mummy and a 16,000 piece mineral collection, the Kentucky Science Center is now the largest hands-on science center in the state. Favorites from the collection, including the mummy, polar bears, and Gemini Trainer are still on display in the Discovery Gallery. We exude a “Do Science” philosophy – taking every opportunity to make interesting and fun science connections with the community. Our message is simple: play, tinker, explore, collaborate, test, experiment, goof up, and try again. We don’t care if you get the right answers – the first time or ever. We want you to be endlessly curious, and always wonder about the world around you. We serve as a neutral place to talk about science issues that can often be evocative, and we are here to encourage creative, open-minded thinking about those issues. Science Matters to Society: Science Literacy empowers individuals and communities to ask questions, think creatively, solve problems, and work toward a better quality of life for all. Science Matters to the Workforce: People who master STEM subjects and skills are best prepared to seize the opportunities and face the challenges of the 21st century. Science Matters to Individuals and Families: Curiosity is a critical springboard for early learners filled with wonder and for teens and adults who crave intellectual ways to better understand their world. At Kentucky Science Center, Science Matters because we make it personal, fun, participatory, and relevant. We are ambassadors of scientific values. In recent years Kentucky Science Center has enhanced its programmatic offerings and partnerships, which today include a vast array of experiences for every audience: very young children, school age students both during and outside of school, teens, teachers and instructional leaders, parents, young professionals, and adults. Daily operations and exhibits at the flagship location in Louisville are further enhanced by facilitated walk-up science experiences, daily demonstrations, and themed activities that change weekly. School’s Out Science Camps run all summer long and on school holidays and breaks throughout the year providing an affordable and enriching out-of-school experiences on which parents can rely. In addition, Family movie nights, discipline specific weekends such as Advanced Manufacturing and Engineering Days, and Socialize with Science events for adults 12 and up, represent the types of programs used to animate the flagship facility throughout the year. While booking school field trips, teachers can select labs, classes, movies from the Science Center library, and pre- and post-visit activities that not only enhance their students’ experience but satisfy statewide curriculum standards. Schools from throughout the region visit the Science Center every year, while others add to their experience or connect via Distance Learning, Assembly Programs, and community or school-wide Science Festivals. In 2017, Science in Play 2GO, a mobile version representing the philosophy of the onsite exhibit, expanded the Science Center’s offsite offerings with a series of 3-month residencies at libraries across the Commonwealth. Science in Play 2GO is largely facilitated by the library staff with support from a dedicated Science Center employee hired locally. With this significant investment and an ongoing presence, Science in Play 2GO is only the beginning of a community compact that advances science literacy statewide.